"What our Country needs now: A strong Bavaria in Berlin." 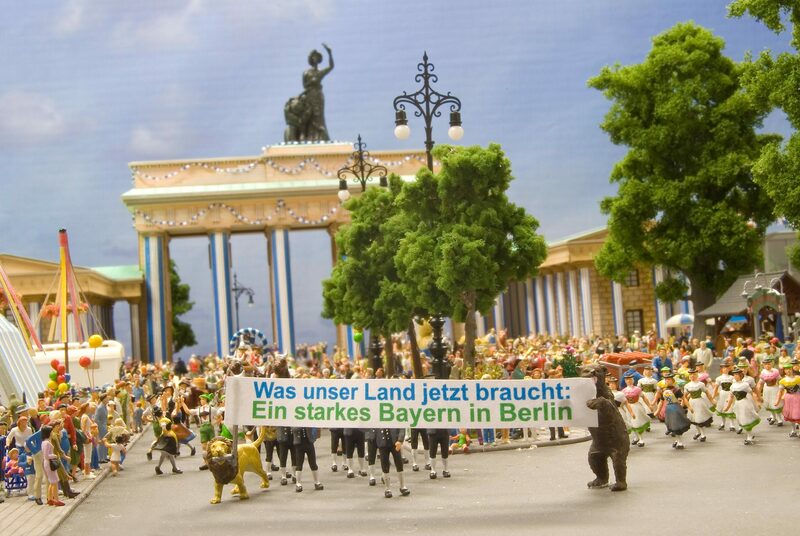 With this slogan, the CSU moves into the federal election campaign – and into the Miniatur Wunderland. 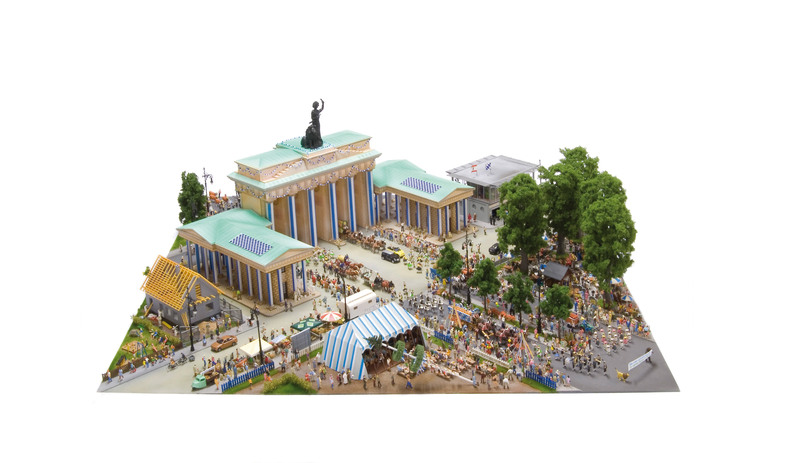 The political claim of the CSU, that is to shape Germany with ideas from Bavaria, is expressed by the blue and white symbols on the Brandenburg Gate. 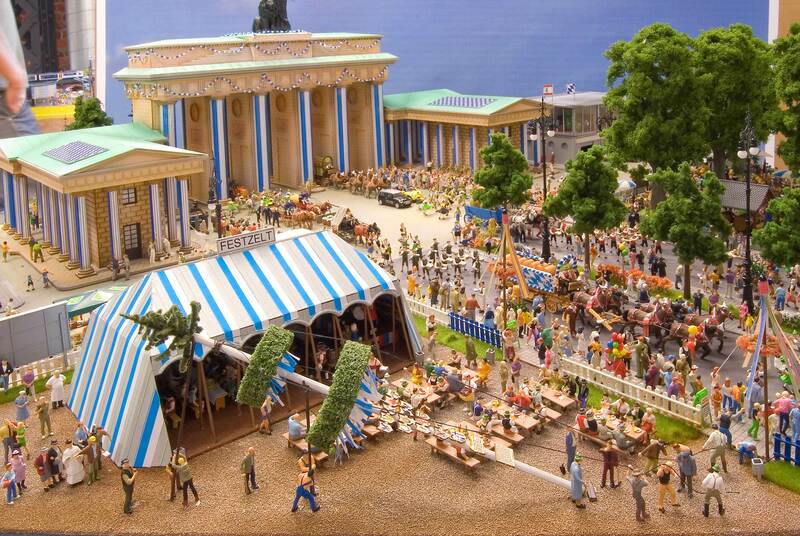 'We colour Berlin in white and blue', giving it a 'Bavarian touch' – that is the central message of the diorama. It is said, of course, with a wink and a healthy dose of self-irony. 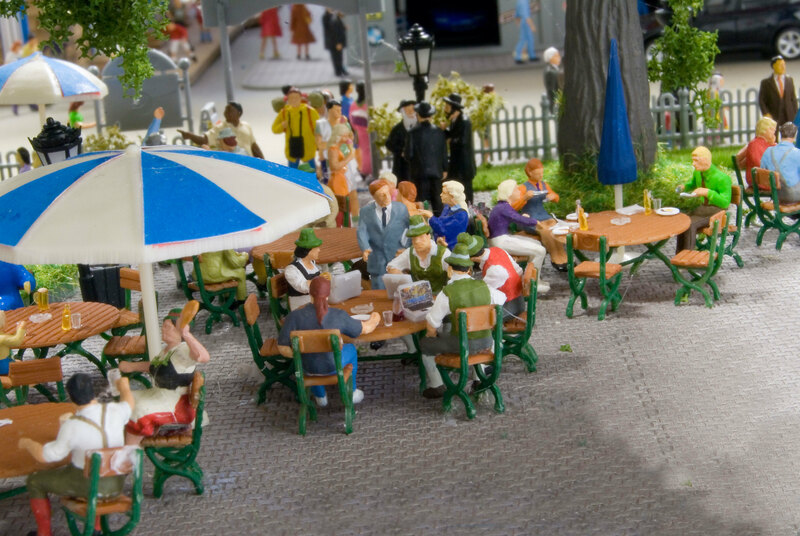 Only at first sight, however, is the ideal country of the CSU a 'Bavarian beer garden idyll' around the Brandenburg Gate. At a second glance, clear political messages and contents of Christian-social politics become recognisable. From future projects such as electro-mobility and service to the people, to a strong middle class, the support of families, a strong agriculture and a good education, the ideal land of the CSU shows a clear political and social vision for our country. Beside them, young men are setting up a May pole on the Paris Square. The ensemble expresses the way Bavaria is rooted in tradition and customs. 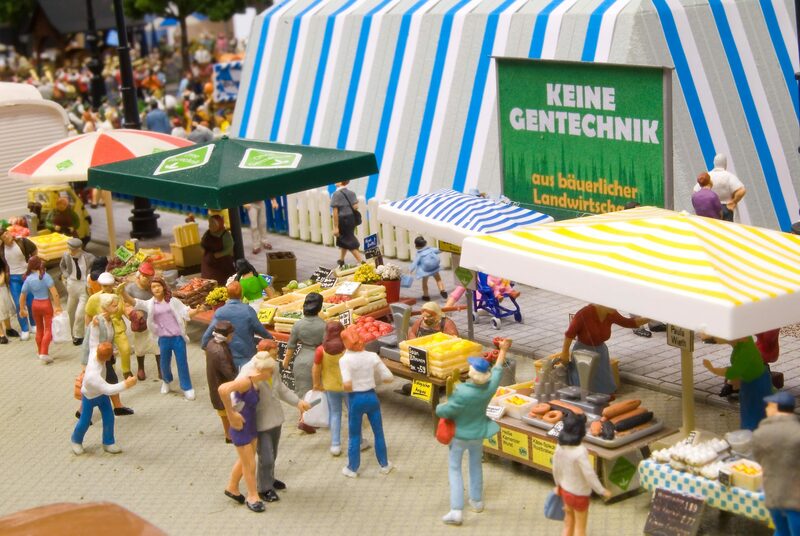 Also a part of Bavaria are farmers who sell their (genetically unmodified) produce at a market stand: Milk, fruit and vegetables from an agricultural family business. 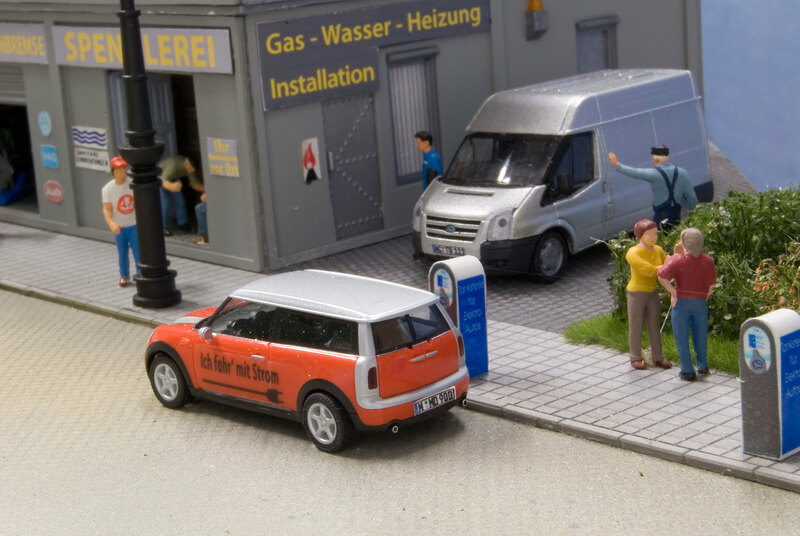 On the street next to the parade, electrically powered cars manufactured by Bavarian companies wait at a gas station while solar cells on rooftops provide power. Both stand for the leading role Bavaria plays when it comes to high-tech and clean energy. A priest is in deep conversation with a few people and represents Christian values which provide a stable basis for our society. 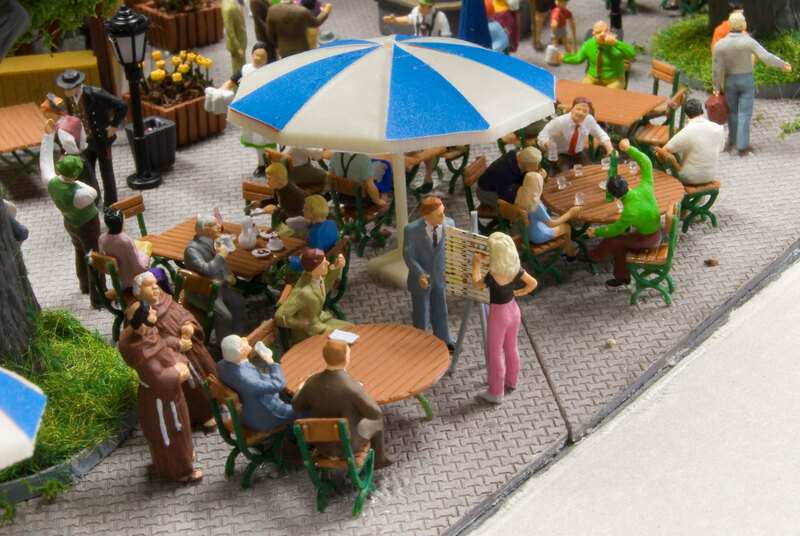 Next to him is a meeting of business people. A woman and a man are making a speech together and symbolise equal rights in the working world. A parade with traditional costumes and a brass band are led by a Bavarian Lion and a Berlin Bear. Together, they are carrying a banner with the words: "What our country needs now: A strong Bavaria in Berlin." 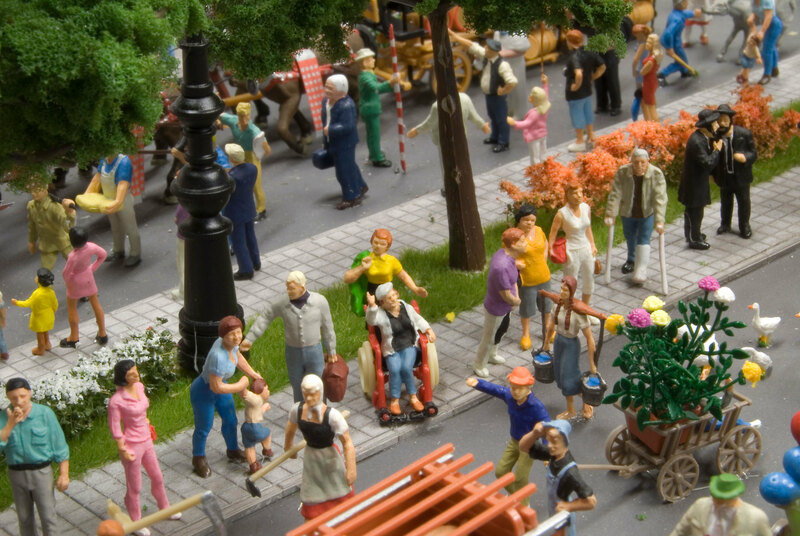 Also near the beer garden, a family with a wheelchair user shows us that people with disabilities also have a place in the midst of a society that is characterised by social awareness. 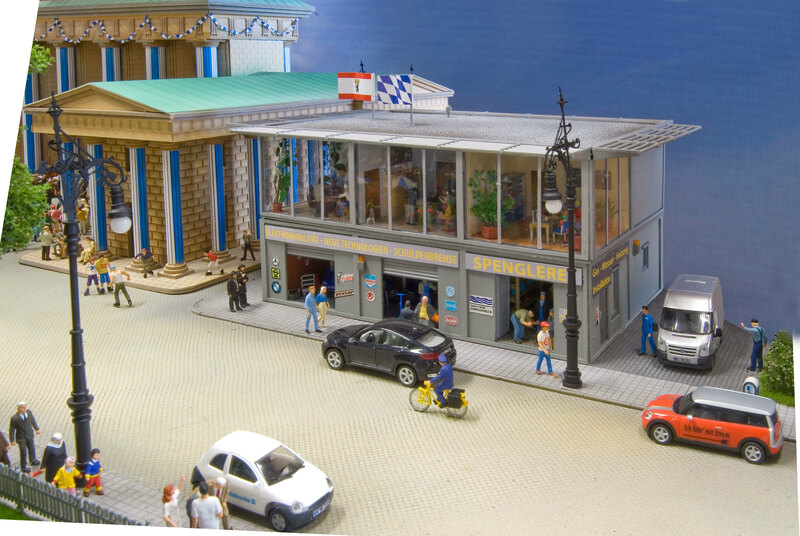 Next to the Brandenburg Gate, small and medium-sized businesses create growth and jobs: In the real world and in this miniature world, small and medium-sized businesses represent the backbone of our economy and are a motor for creating employment. A policeman is helping an old lady across the street and represents that people may live freely and safely thanks to the reliable work of the police. 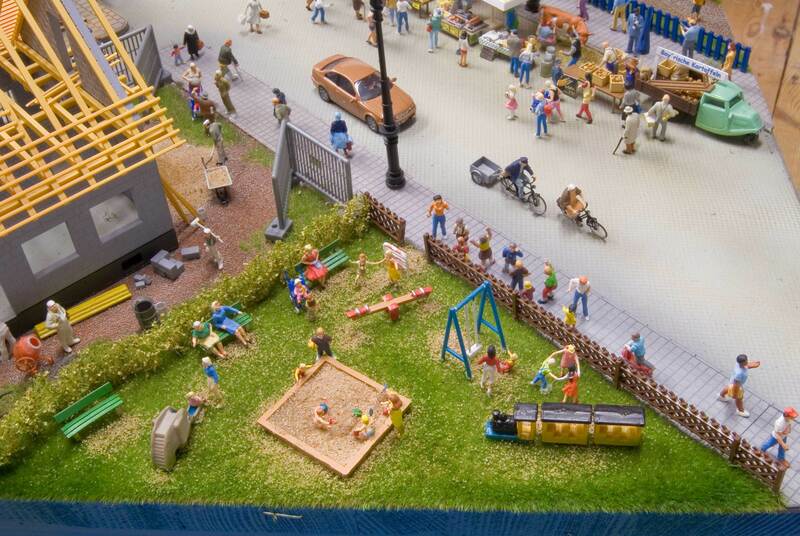 Next to a private residential building is a playground with children and educators. Childcare is sufficiently available, true freedom of choice is a given in the land of the CSU: Parents may decide for themselves if they choose to make use of childcare options or wish to take care of their children at home. The greatest resource for the future of a country is what is inside people’s heads: Behind the Brandenburg Gate is a young learning group with stacks of books. 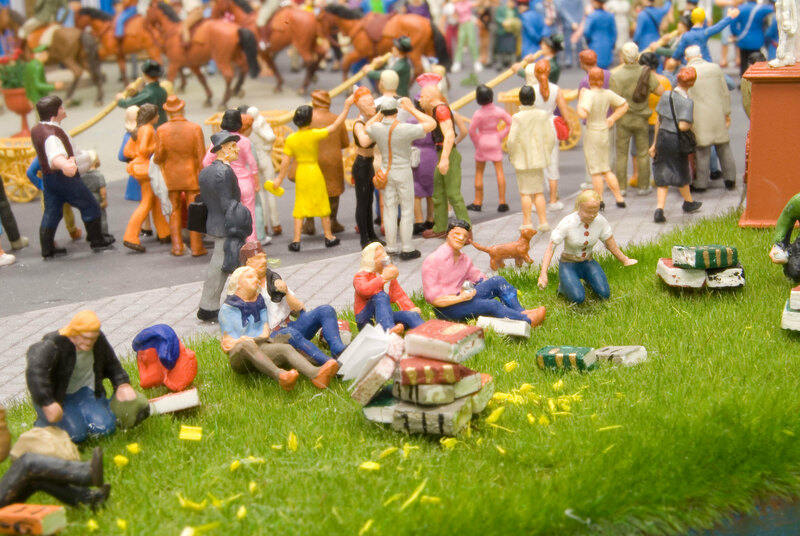 Just as in real life, the best education in this miniature land provides the best opportunities for its people.